White House officials of the Ford administration attempted to keep a presidential review panel—the Rockefeller Commission—from investigating reports of CIA planning for assassinations abroad. 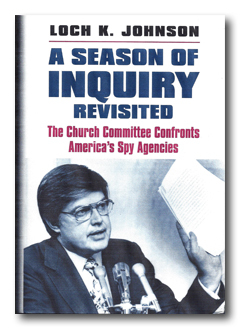 President Ford passed investigative materials concerning assassinations along to the Church Committee of the United States Senate and then attempted—but failed—to suppress the Church Committee’s report as well. The White House markup of the Rockefeller Commission report used the secrecy of the CIA budget as an example of excesses and recommended Congress consider making agency spending public to some degree. The current controversy over drone attacks has an important backstory. During the 1970s it became known that the Central Intelligence Agency (CIA) had plotted the murder of foreign individuals. These persons for the most part were prominent leaders or even heads of state. That the U.S. government had in any way been engaged in murder became a dark charge against the CIA, and helped inflame the political climate in a way that ensured investigations of the U.S. intelligence agencies would occur. Rockefeller’s key opponent in the fight over investigating assassinations was the panel’s staff director, David W. Belin. A lawyer for the Warren Commission, empanelled to look into the Kennedy assassination in 1963-1964, Belin had been handpicked by Ford for the Rockefeller group. Ford, one of the Warren commissioners, was confident of Belin’s loyalty, but this time the lawyer fought hard to investigate deeply. The investigators sought CIA documents on assassination plots conducted in its history and information on administrative routines. They also questioned key witnesses. As CIA lawyer John S. Warner admitted under questioning, the agency “certainly” had “no specific authorization” to conduct assassinations (Document 7). Warner additionally admitted he was “not clear” that a president had the constitutional authority to order an assassination, though that “might” lie within his powers. Documents in this electronic briefing book reveal the views on the assassination reports of not only Belin but key members of his staff. At the time, in the spring of 1975, the Senate Select Committee to Study Governmental Operations with Respect to Intelligence Activities (the Church Committee) was just being constituted but the Rockefeller Commission inquiry was already in progress. Days after Church Committee members met with President Ford, press adviser David Gergen advised the president to say nothing about assassinations (Document 1). The jurisdictional and procedural issues regarding whether to include an investigation of assassination plotting, so far as the Rockefeller inquiry was concerned, were fought out over this same period (Documents 2,3,4,5). White House officials, including panel chairman Rockefeller, continued a rearguard action in opposition, first to covering CIA assassination plots at all, and later to including that material in the Rockefeller Commission report. 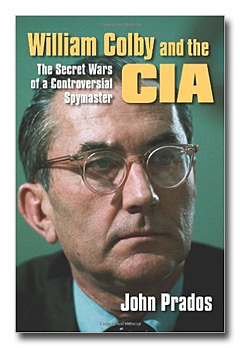 Belin continued to press for the coverage, took a primary role in interviews the commission conducted for this part of its inquiry, and became the main author of the portion of the report dealing with CIA plotting against Fidel Castro (including Operation ZR/RIFLE). 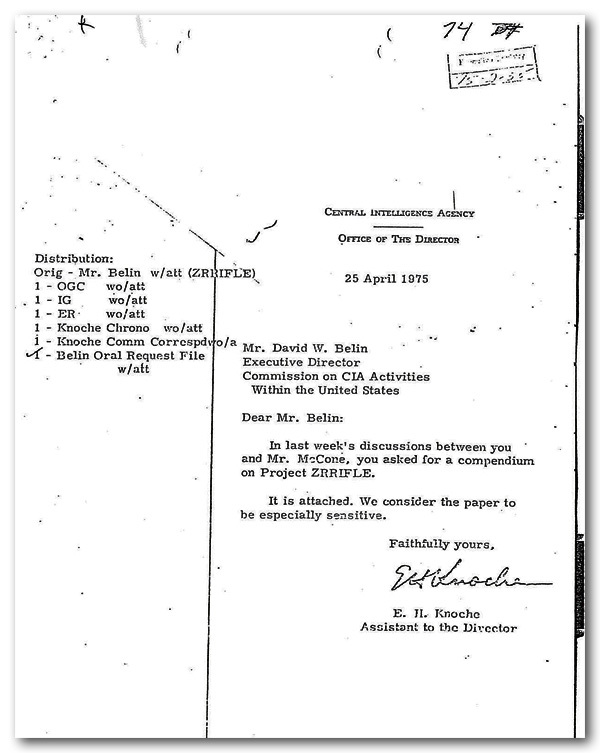 The Rockefeller Commission collected a wide array of evidence, as illustrated by a staff member’s report on what could be learned from the papers of former CIA Director John McCone, and a CIA compendium document on the ZR/RIFLE project (Documents 8, 9, 10). As of mid-April 1975, Belin expected to have the assassination portion of the panel report complete by the end of the month. He so informed White House officials. However, the CIA dragged its feet on providing materials, and Secretary of State Henry Kissinger, who initially promised cooperation, provided little. Kissinger became a major actor in the struggle to suppress the Rockefeller assassinations report. [iii] When Belin scheduled a press conference to announce the panel’s assassination findings, deputy assistant to the president Richard Cheney and White House Counsel Philip Buchen, citing Kissinger’s concerns, intervened to induce Belin to cancel it. As the Rockefeller Commission moved toward finalizing its report, panel staff concluded that the assassinations issues were going to be buried. Several recorded their objections to this course (Documents 11, 12). The Rockefeller Commission’s public affairs director, for one, observed that leaving out assassinations would make the report seem like a cover-up and cast doubt on the Commission’s entire project (Document 13). Nevertheless Belin and staff could not prevent determined superiors from holding back the entire subsidiary report that dealt with assassinations. Meanwhile at the White House, Cheney led the way in “editing” the Rockefeller report—including suppressing the assassinations section. The final draft of the full report contained a brief passage noting that President Ford had asked the panel to investigate the assassination plots after its inquiry began, that the staff had not been able to complete the investigation, and that Ford had then asked that assassinations material be turned over to him. The Cheney edit inserted doubts by adding that it was unclear whether assassinations fell within the scope of the Commission’s mandate, thus resurrecting jurisdictional issues which had previously been resolved. 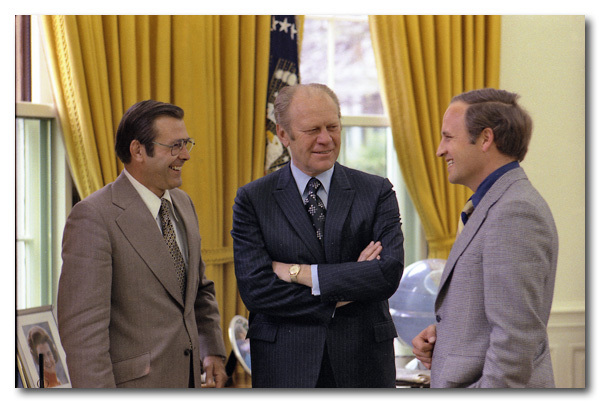 The revised language also reduced President Ford to a bit player—asserting only that he had “concurred” inthe panel’s decision to investigate rather than that he had revealed the existence of CIA plotting and then been obliged to modify the Commission’s terms of reference to include an investigation of the matter. White House editors also changed the original text, from indicating that records were still in the process of being turned over to the president, to the statement that it already “has been” done. Document 19 reviews the substance of the Commission’s evidence and findings relating to assassinations. In Document 20, White House lawyer Buchen discusses the substance of the findings. The White House “edit” (Document 15) provides clear indications of the direction of the White House’s concerns vis-à-vis the conclusions of the wider Rockefeller Commission investigation. The report had determined that various intelligence agency actions were illegal and explicitly called them “unlawful.” The edit resisted that formulation and talked instead about actions that merely exceeded agencies’ statutory authority. The Cheney-supervised edit made a single exception—the White House changed Commission language which found the CIA had exceeded its authority in the course of drug experiments to say that these had been “illegal” (p. 37). Rockefeller investigators had probed White House-CIA relationships that landed the agency in trouble during Watergate as a result of White House instructions to provide psychological profiles of prominent individuals, disguises for White House operatives, and documents on past CIA activities. The full Commission had then approved a recommendation (number 23 on its list) which specified that a single, authoritative channel be established for all White House requests to the CIA and that this be routed through the NSC staff. Following CIA internal directives (ones that had, among other things, resulted in the compilation of the “Family Jewels”), the Rockefeller Commission made clear that any CIA employee who questioned the “propriety” of any White House order should take that concern either to the CIA director or the agency’s inspector general. The White House editors changed this directive (in renumbered Recommendation 26 of the published report). Now, employees were to be instructed only to question requests that came outside the authorized channel, and to state their concerns only to the CIA director. Improper requests came off the table, and the inspector general was not to have automatic jurisdiction. Among the abuses that led directly to President Ford creating the Rockefeller Commission were charges the CIA had compiled dossiers on American citizens and infiltrated political groups that opposed the U.S. war in Vietnam. In this instance the Rockefeller panelists entered a blanket finding that the files and lists of citizen dissenters were “improper.” The White House edit changed this conclusion, indicating that the “standards applied” had resulted in materials “not needed for legitimate intelligence or security purposes,” and that this merely applied to “many” records gathered about the antiwar movement (see unnumbered page revising p. 41 in the report). White House editors eliminated a Commission recommendation (number 17 in the original text) that applicants for agency positions and foreign nationals acting on behalf of the CIA be informed more clearly that they could be subjects of U.S. security investigations. The Cheney-inspired edit also added recommendations the Rockefeller panel had not voted. One (Recommendation 29 in the published report) advocated for a new civilian agency committee to be formed to resolve concerns about the use of CIA-developed intelligence collection mechanisms (overhead photography) for domestic purposes. Another White House-originated point (Recommendation 20 in the published report) sought to increase public confidence in the integrity of the intelligence agencies by instructing them to review their holdings of secret documents periodically with the aim of declassifying the maximum amount of material. This recommendation was more honored in the breach. In a related case, White House editors eliminated a lengthy commentary from one of the commissioners, the former solicitor general of the United States, Erwin N. Griswold. A detailed footnote quoted Griswold as saying that an underlying cause of the problems confronting the CIA was its pervasive atmosphere of secrecy, and recommending Congress consider making public the CIA budget (page 132-3, renumbered p. 15 in Document 15, footnote 2). The commission quoted Griswold in the context of a recommendation about the President’s Foreign Intelligence Advisory Board. White House editors converted Griswold’s statement into part of the main text which the entire Rockefeller panel had supposedly agreed upon, and used it to buttress a recommendation to create a joint committee of the Congress to oversee the CIA and other intelligence agencies and went on to Recommendation 4 — that Congress consider making the CIA budget, to some degree, public. Thus the White House edit both put words into Rockefeller Commissioners’ mouths and dispensed with concerns they had expressed. Apart from the substantive issues raised thereby these actions amounted to direct political interference with a presidential advisory panel. Ford may have been comfortable with his subordinates’ maneuvers, but they helped drain credibility from the Commission’s investigation, as the panel’s own staff had warned in discussions of whether to include its assassinations report (Documents 11, 12, 13, 14). 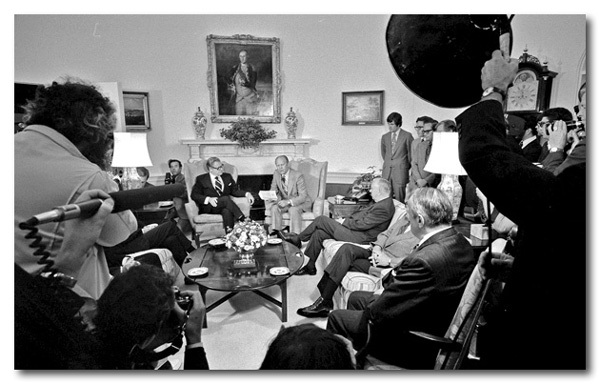 With the committee at the point of asking that the full Senate release its report, on October 31 President Ford wrote Senator Church to ask that the report be kept secret on national security grounds (Document 21). Several days later the committee voted to reject Ford’s demand, and Church answered his letter on November 4, writing, “in my view the national interest is better served by letting the American people know the true and complete story . . . . We believe that foreign peoples will, upon sober reflection, admire our nation more for keeping faith with our democratic ideals than they will condemn us for the misconduct itself” (Document 22). In a display of legislative strategy, on November 20 the Senate convened in a secret session to debate releasing the Church assassinations report but failed to delay or prevent its being made public, because the committee had approved the report while the full Senate took no vote on whether to enforce a rule that would have held up release. The White House took a different tack. A steering group of officials working on the political crisis of the “Year of Intelligence,” proposed that President Ford issue an executive order (E.O.) to govern intelligence agencies and operations, and that the order include a prohibition on assassinations. Senator Church objected that anything a president set by fiat could be changed by fiat as well, by means of a future executive action. Besides, the Ford executive order, issued in February 1976, lacked the definition that would have been supplied by the Church Committee-recommended statute. President Jimmy Carter issued his own executive orders on intelligence, in a preliminary form in May 1977 and in a reworked version in January 1978. The assassination prohibition would be widened somewhat, by removing the word “political,” which the Ford E.O. had used as a qualifier (as in “political assassination”), and by extending the ban beyond government employees to anyone working for or on behalf of the United States. The Carter ban would be repeated verbatim in President Ronald Reagan’s E. O. 12333, issued on December 4, 1981. Every subsequent president has continued the ban, and the Reagan E.O. itself remains in force. 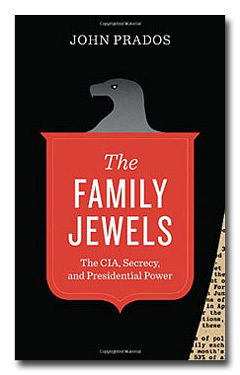 [i] See John Prados, The Family Jewels: The CIA, Secrecy and Presidential Power. Austin: University of Texas Press, 2013, pp. 160-161. [ii] Nicolas Djumovic, “Ronald Reagan, Intelligence, William Casey, and the CIA: A Reappraisal,” Central Intelligence Agency, Center for the Study of Intelligence, April 2011, pp. 7-8. [iii] Prados Family Jewels, pp. 163-165. [iv](Report to the President by the Commission on CIA Activities within the United States(Rockefeller Report), June 1975, pp. 251-269. [v] Loch K. Johnson, A Season of Inquiry: The Senate Intelligence Investigation. Lexington: University Press of Kentucky, 1985, p. 50. A new edition of this book will appear very shortly from the University of Kansas. [vi] United States Senate (94th Congress, 1st Session). Select Committee to Study Governmental Operations with Respect to Intelligence Activities. Interim Report: Alleged Assassination Plots Involving Foreign Leaders, pp. 289-290. 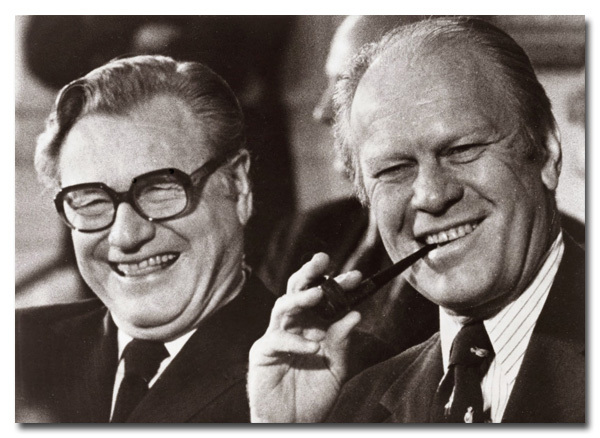 Nelson Rockefeller with President Gerald Ford in an undated photo.